After a lot more effort than I expected, I’m pleased to unveil version 2.0 of All That Is Necessary. For those who care about such details, I’ve migrated my original Blogger blog to the WordPress platform, hosted on my personal domain, kirkpetersen.net. And here I thought I had a distinctive name. But I digress. There are two main reasons for changing the blog. First, WordPress is pretty widely acknowledged to be the best and most versatile blogging platform, far more flexible and robust than Blogger. I knew this before I started blogging, and initially tried to set up on WP, but ran into some technical problems that I couldn’t figure out how to solve. (The company’s promise of the “famous five-minute WordPress installation” is more than just an exaggeration, it’s a falsehood.) I decided to launch on the much simpler Blogger platform with Blogspot hosting, rather than fight my way through the technical thicket, because I wasn’t completely sure I would even enjoy blogging. Turns out I do. Second, I decided to integrate my blog with my marketing site, after initially being leery of doing so. The leeriness came from the fact that I stake out some fairly pointed political views here, and I don’t want to alienate any potential clients and employers. I finally reconciled myself to the fact that if you Google my name, the second and third results currently are my marketing site and my blogspot blog, respectively (curse you, top-ranking kirkpetersen.com techie guy!) Since it’s not really possible to segregate my two online identities completely, I may as well get whatever benefit I can out of integrating them. They’re not truly integrated yet, as you can see at a glance from the very different look of the marketing site. That site was lovingly hand-coded by the Web Goddess, and it continues to serve me well. Interestingly, even though the blog gets more than 50 times as many visitors as the marketing site, the latter ranks above the former, both in the Google search results and in Google’s mysterious PageRank rankings (blog = PR1, marketing site = PR2). 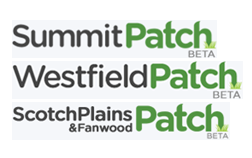 Sign up for the RSS feed or email delivery if you want to make sure you never miss a post (hi Mom!). If you signed up for RSS at the old site, it should get forwarded automatically for a couple of weeks, but I think eventually you’ll need to sign up again here. Thanks for visiting — hope to see you back soon. So, what do you think of the new site? Find anything broken? 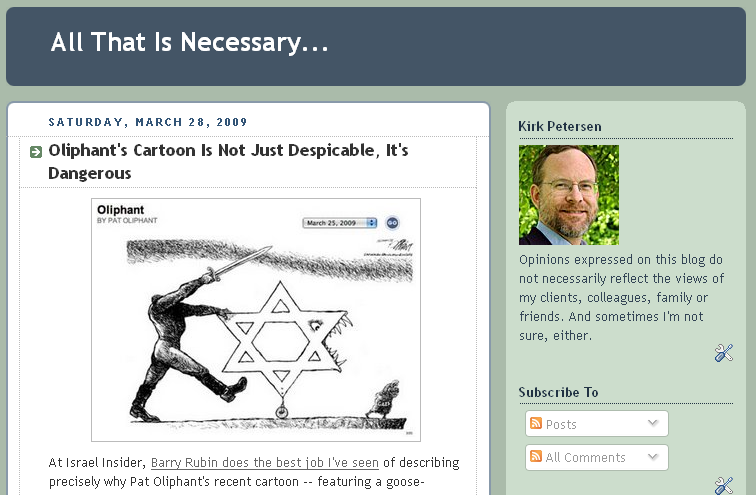 At Israel Insider, Barry Rubin does the best job I’ve seen of describing precisely why Pat Oliphant’s recent cartoon — featuring a goose-stepping, headless swordsman pushing a Jew-shark-on-a-unicycle — is so powerful, and so powerfully offensive. Hat tip: Andy McCarthy. 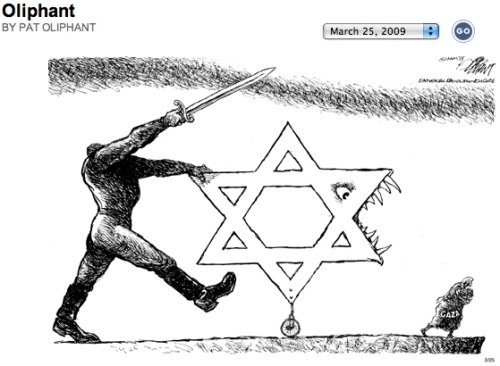 Is the cartoon truly anti-Semitic, or is it “merely” anti-Israel? I say both, but whatever. The point is that the cartoon is a dangerous lie. It’s dangerous not just to Israel, but to America, to the West, and to any society that faces asymmetric attacks from Islamic fascists. Oliphant like many or most Western intellectuals, academics, and policymakers, still doesn’t understand the concept of asymmetric warfare. In this, a weaker side wages war on a stronger side using techniques it thinks can make it win. What are these techniques? Terrorism, indifference to the sacrifice of its people, indifference to material losses, refusal to compromise, extending the war for ever. This is precisely the technique of Hamas: let’s continue attacking Israel in order to provoke it to hit us, let’s target Israeli civilians, let’s seek a total victory based on genocide, let’s use our own civilians as human shields, and with such methods we will win. One way we will win is to demonize those who defend themselves, to put them in positions where they have a choice between surrender and looking bad. This cartoon is a victory for Hamas. But it is also a victory for all those who would fight the West and other democracies (India, for example) using these methods. Remember September 11? In World War II — the “good war” — we faced enemies that commanded military infrastructure comparable to our own. The enemy was both willing and able to meet us on the battlefield, and was capable of inflicting severe damage. To my mind, that parity helps justify actions we took that otherwise would be morally ambiguous at best: Hiroshima, Nagasaki, Dresden. Today’s enemies are financed by immense oil wealth, but have virtually no industrial base of their own. Hamas buys missiles that it could not possibly produce and shoots them from Gaza into Israel. For the September 11 attacks, al-Qaeda took flying lessons at American flight schools, hijacked American jetliners and crashed them into buildings born of America’s industrial and architectural prowess. Because today’s good guys are immensely more powerful than today’s bad guys, the bad guys have to change the context. They have to use our strength and our values against us. They count on the fact that we — America, Israel — will strive, at great risk to our own troops, to limit civilian casualties on their side. Israel could have killed every human being in the Gaza Strip with zero or close to zero Israeli casualties. Instead, Israel makes a practice of warning the human shields who live in houses that are targeted because they hold arms caches. Meanwhile, Islamic fascists are more than willing to cause the deaths not just of our civilians, but of their own as well, because the PR exploitation of their own civilian casualties is a key weapon in their arsenal. The only thing Hamas values more than dead Israelis is dead Palestinians. Preferably Palestinian children. We face enemies who are willing to breed their own children for martyrdom. Enemies practicing asymmetric warfare will always be able to inflict casualties, but the only way they can win is if they can persuade enough of us that it is somehow immoral to fight back. That’s why Rubin concludes that Oliphant — who in a different context would qualify as a classic example of a useful idiot — has scored a victory for Hamas. A straightforward guide to the financial mess. I missed it when it first came out, but the New York Review of Books last month published one of the best comprehensive explanations I’ve seen of the causes of the current economic unpleasantness. Weighing in at just over 5,000 words, it’s not a quick read — but it covers a lot of territory, as indicated by its word cloud, above, from wordle.net. The essay, which doubles as a review of three recent books about the crisis, does a skillful job of explaining the interaction of a wide variety of factors, including securitization of mortgages, the housing bubble, the growth of unregulated hedge funds, rating agency conflicts of interest, subprime mortgages and more. 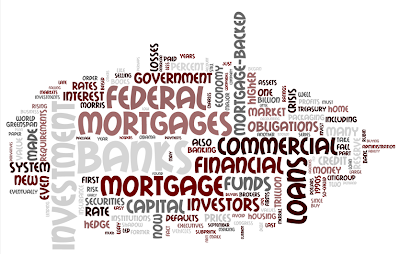 It was principally the investor appetite for the mortgage-based securities and the easy profits made by the banks and mortgage brokers that led to the mortgage-writing frenzy in the 2000s, not encouragement by the federal government to lend to low-income home buyers. He neglects to mention what form this “encouragement” took — fines and other penalties against banks that did not issue “enough” mortgages to borrowers from disadvantaged groups. With the government telling them to write mortgages or else, and with a securitization system that distributed risk so widely that no institution had a meaningful stake in the performance of any individual loan, and with the widespread belief that refinancing would be possible because housing prices only go up… it’s no wonder that the ranks of home “owners” swelled well beyond the pool of people who could actually afford to own a home. Predictably, Madrick believes the answer is more government regulation. If solutions are to be found, the nation requires robust and pragmatic use of government, free of laissez-faire cant and undue influence from the vested interests that have irresponsibly controlled the economy for too long. Another necessary component for reviving the credit system involves the self-destructive accounting rules and loan covenants that are making the crisis worse than it need be. The losses required to be taken under mark-to-market accounting, and the consequent reduction in capital, reinforce the fall in asset values. Similarly, current ratings requirements force the financial institution to sell investments to raise capital. 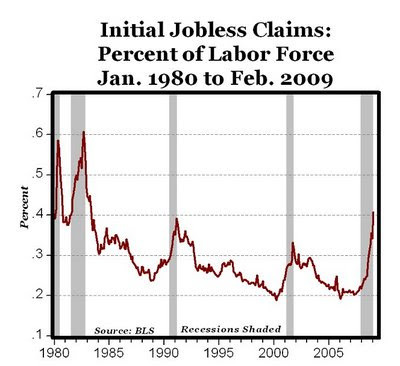 Summing up, Madrick says “This is, as many economists now concur, the worst economic crisis since the Great Depression.” Well, no. It’s possible that things will get worse from here, but for now all you can really say is that it’s the worst recession since 1982. 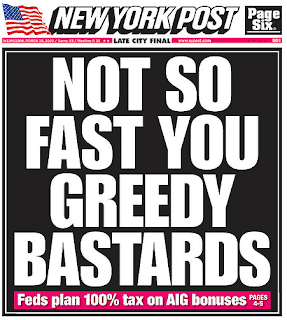 This time, the Obama Treasury Department — sounding a lot like the Bush Treasury Department — promised another $30 billion to the American International Group, the giant insurer…. What no one is saying — the Bush folks wouldn’t, and the Obama team seems to have taken the same vow of Wall Street omertà — is which firms would be most threatened by an A.I.G. collapse. Also last week, comparisons of Obama and Bush spread to the late-night comedy shows (hat tip: Pajamas Media). Jon Stewart is a very funny man, and is backed by a team of writers and researchers who expertly suss out whiffs of hypocrisy by comparing current news footage with embarrassing older footage. Stewart is a stalwart leftie, but I admire his craft even though I frequently disagree with his views. He has distinguished himself as a rabid Israel-hater who regards the Jewish state’s defensive measures as the primary cause of jihadist terror. He is a shameless apologist for Saudi Arabia (where he once served as U.S. ambassador) despite its well-documented record of exporting terrorists and jihadist ideology. And he is a long-time sycophant of Beijing, where he served as Richard Nixon’s interpreter during the 1971 summit and later ran the U.S. diplomatic mission. As Jake Tapper notes on his ABC News blog, Freeman appears to blame “the Israel Lobby” for the 9/11 attacks. [H]ow long can the rest of the mainstream media hold out without reporting on an embarrassing debacle for the Obama administration? This is the John Edwards story on steroids — a virtual conspiracy of silence with little if any journalistic justification. And here the issue is really important — the appointment of a key intelligence official who is alleged to harbor serious conflicts of interest and extreme views. How long? We should know later today. Blair’s testimony is already under way. We’ve found over time that the best way to inform policy is to have strong views held within the intelligence community and then out of those we come out with the best ideas. 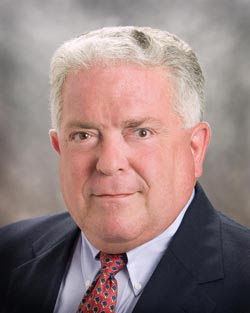 Updated Update: Late this afternoon, apparently shortly after I left my global headquarters in Maplewood to go into Manhattan for an event, Chas Freeman withdrew his nomination. The earliest timestamp I can find is on a Wall Street Journal blog at 5:29 p.m. Eastern. More than four hours later, there is no mention of the withdrawal on the homepages of the New York Times, Washington Post, CNN or MSNBC. The Times and the Post are probably keeping their powder dry while they prepare articles for their print editions, but I have no idea what the excuse is for CNN and MSNBC. Yet another high-profile Obama appointee has to withdraw? That isn’t news?